Folks are shown the social network's updated terms and conditions to agree to, with what appears to be pending notifications from friends in the top right corner – such as unread messages and other alerts. Netizens have to agree there and then to hand over their personal data to see the awaiting texts and notices, even though none may actually be waiting for them. That is just one of the claims against the company in a legal challenge that was filed the day that privacy-protecting GDPR legislation came into force. Under the European law, companies are required to gain consent before they are allowed to use individuals' personal data – a situation that put info-hoarding Facebook and other tech giants into a difficult bind. Facebook derives most of its income from gathering as much personal information about people as possible, and then packaging those records to be useful for advertisers. But in order to keep gathering that data it had to get its millions of European users to explicitly agree to it. We previously covered how Facebook had carefully designed its user interface to make it time-consuming for users to withhold their private information, while repeatedly offering a single button to end the process and give it permission to continue scooping up their personal data. The company also gave lengthy and one-sided arguments for why users should continue to allow it to gather and store their data. But the Silicon Valley giant took that misdirection one stage further, according to privacy activist Max Schrems' latest lawsuit, when it placed red circles above the two icons at the top of the page that indicate users have received new messages and notifications – a core interactive component of the entire Facebook experience – and implied that you needed to agree to its new terms of service to see them. Oh look, a message from one of my friends! Message reads: Sucker. 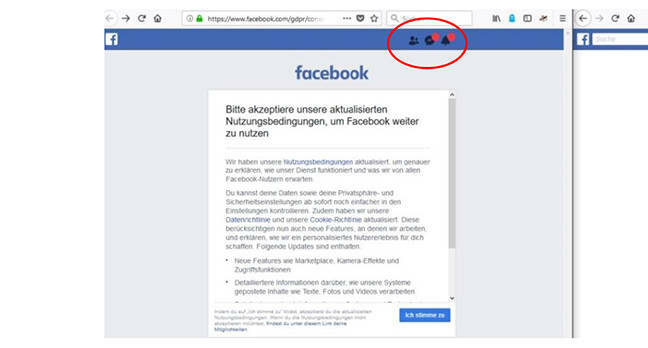 If a user hadn't agreed to Facebook's new terms – which include the continued gathering and storage of their personal data – as the May 25 deadline crept closer, the two red dots appeared even where there weren't any messages or notifications. This approach, the lawsuit claimed, violated GDPR since it is neither fair nor transparent. This dots approach and the user-interface fudging came on top of a range of other methods the company used to pressure individuals into agreeing to Facebook's terms. For example, if European users did not go through the Facebook-guided process before the deadline, their account was simply blocked when there was no obvious need for the company to do so. It also made it hard for punters to find the option to delete their account – which would have killed off the social network's access to their data altogether and was the only other option to agreeing to new terms and conditions – by hiding the delete option in small text below a large colored button that led them back to the Facebook-guided process. In short, the Mark-Zuckerberg-run biz went to great lengths to get people to unwittingly agree to let it soak up and sell any and all data it gathers about them.